5th grade G/T students visit Hot Springs Mountain Tower. 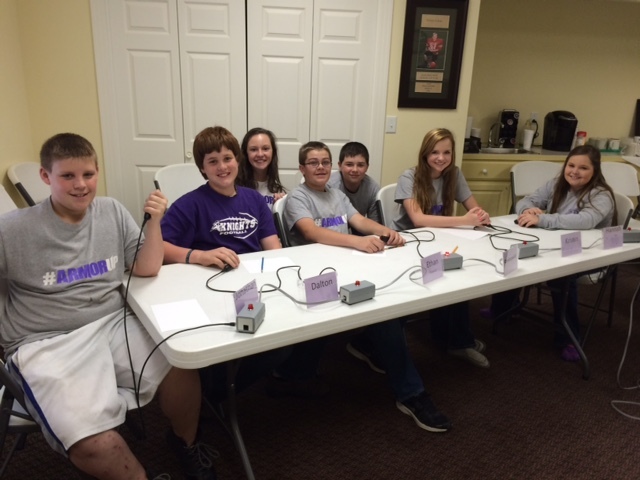 7th grade G/T student participate in a quiz bowl tournament at HSU. 4th grade students visit the planetarium at HSU. 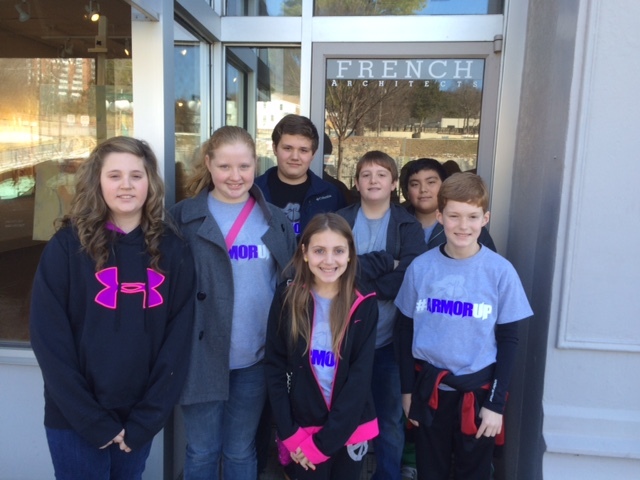 5th grade G/T students visits French Architect in Hot Springs in conjunction to their study of "Structures". The 4th grade G/T students visit Chambers Bank in Amity. 5th grade G/T students show off school spirit items. 4th grade G/T students display pamphlets made containing information about their business that they designed. Congrats to the 7th grade G/T students for winning their final quiz bowl tournament of the year! They played in the Dawson Co-op Regional Tournament in Arkadelphia. 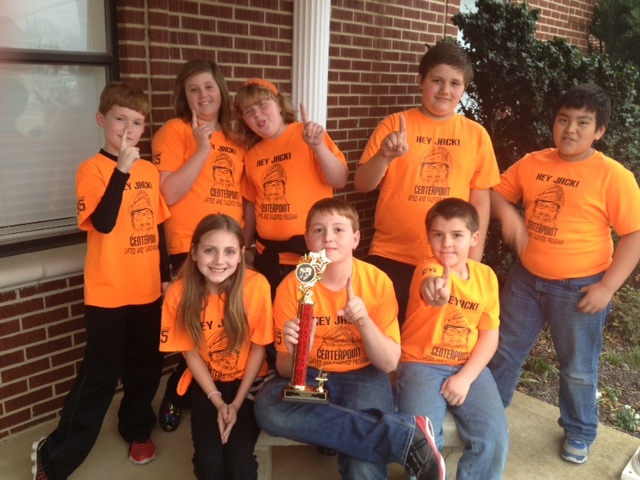 The 4th grade G/T students won the Dawson Co-op Regional Quiz Bowl Tournament in Arkadelphia. The 6th grade G/T students visited Discovery Museum for their end of year field trip. The 5th grade G/T students visited the Capital in Little Rock. This trip was in conjunction with their currents study of "Government". Congratulations to the 4th grade G/T students for winning their first tournament at Murfreesboro! The team went undefeated all day seeding them 1st place in the tournament. The final game, they defeated Ashdown, winning the tournament. 7th grade G/T students recently visited Garland County Juvenile Court and Detention Center in Hot Springs. 6th and 7th grade G/T students presented Germ City to the primary students. The G/T students talked about the importance of washing your hands to the students. 6th grade G/T students recently visited Mercy Hospital in Hot Springs. While there, the students toured the e.r., nursery, microbiology lab and LifeNet. 4th grade G/T students make pottery while reading "The Single Shard." 5th grade G/T student visited French Architect and downtown Hot Springs in conjunction to their current study of "Structures". 6th grade G/T students construct a DNA Double Helix from marshmellows and toothpicks. 4th grade G/T students construct their own board game over the book "A Single Shard." 5th grade G/T students construct bridges out of popsicle sticks. 4th grade G/T students visited HSU's Planetarium. While there, they viewed a program, "Cowboy Astronomer." The 7th grade G/T students visited Old Washington State Park for "Civil War Days". 6th grade G/T students observing how things were done in the Frontier Days. 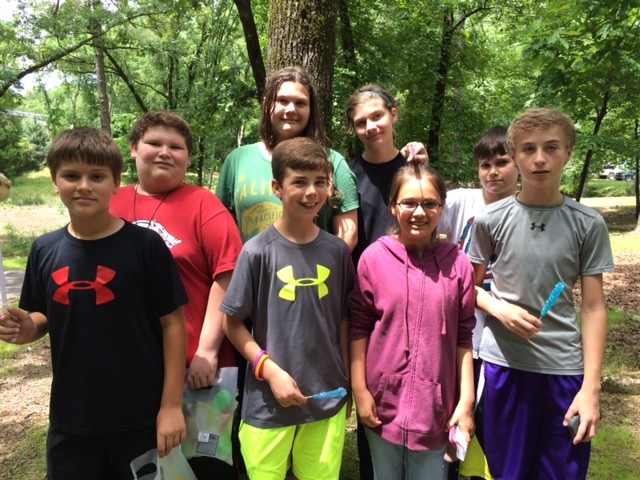 The 6th grade G/T students recently visited Old Washington State Park for "Frontier Days." 5th grade G/T students use I-pads for researching Westward Expansion. 4th grade G/T students use I-pads for research on the Solar System. Congratulations to the 7th grade G/T students who won the Dawson Cooperative Quiz Bowl Tournament at HSU! 6th grade G/T students trying out the telescope at HSU Planetarium. The 6th grade G/T students visit the HSU Planetarium. While there they viewed the program "Mars Quest" in conjunction with their current study of "Frontiers". 4th grade G/T students painting pottery. 4th grade G/T students try their hand at the pottery wheel. Students were able to make a piece of pottery while reading "A Single Shard." 7th grade G/T students visit Garland County Juvenile Court and Detention Center in Hot Springs. Students get a tour of Life Net Ambulance. Students visit the Microbiology Lab at Mercy Hospital. The Microbiology lab didn't smell pleasant to some of the students! 6th grade G/T students recently visited Mercy Hospital in Hot Springs in conjunction to their current study "Frontiers". 5th grade G/T students build bridges using Keva blocks. 4th grade G/T students design board games based on the book "A Single Shard". 7th grade G/T students ran mock election polls for the Presidential Election on November 6th. 6th grade students ran mock Presidential Elections on November 6th at CHS. 5th grade G/T students visit Historic Washington State Park for Civil War Day. 7th grade G/T students performed a puppet show for the primary students during Red Ribbon Week. 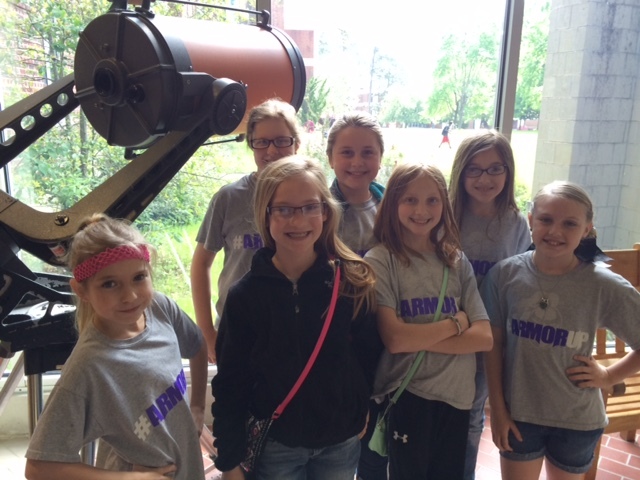 4th grade G/T students visited the Planetarium at HSU in conjunction with their current study of Solar Systems. The 6th grade G/T students performed a puppet show for the primary students during Red Ribbon Week. 4th grade G/T students make a mobile of the Solar System. 7th grade G/T students enjoy the spotlight at Discovery Museum in Little Rock. 5th grade G/T students making pottery during study of "Traditions". 5th grade G/T students celebrate after winning a quizbowl tournament at Caddo Hills. 8th grade G/T students visit Central High School in Little Rock. 7th grade G/T students work on Mars Colony project. 8th grade G/T students observe Robotics demonstration at Clinton Library. 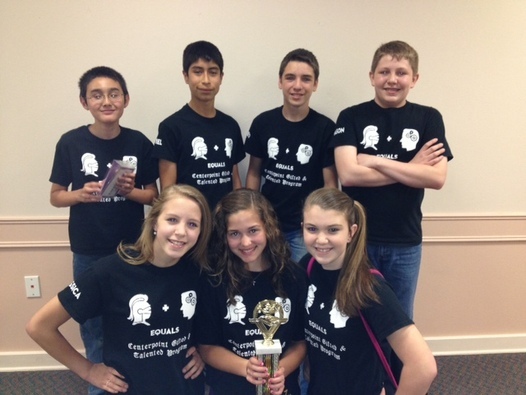 8th grade G/T students place 2nd in Genoa quizbowl tournament. G/T student showing her differentiation project from Science class. 5th grade G/T students visit the HSU Planetarium. 6th grade G/T students at Mid America Museum. 6th grade G/T students visit the State Capital. The 6th grade G/T students perform a puppet show for the primary students during Red Ribbon Week. 5th grade G/T students after winning their first quizbowl tournament at HSU. 7th grade G/T students at KARK News with Mallory Hardin.